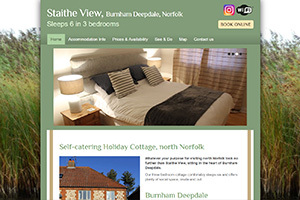 Based in north Norfolk, we boast over 10 years of experience in running successful holiday cottage websites and other tourism related websites. We can advise and assist with integration of availability calendars and online booking systems. Customers can opt for our in-house package (see below) or choose an entirely bespoke design (subject to our usual costs). 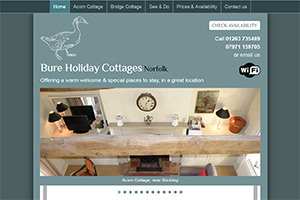 Our unique ‘Holiday Cottage Website’ package is aimed at getting you up and running as quickly as possible, with minimal costs. 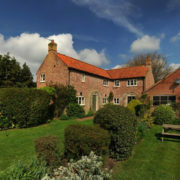 For this, we use a tried and proven in-house layout which meets all the needs of holiday cottage owners. Our holiday cottage websites are attractive, easy to use and provide owners with a straightforward solution for updating content. This type of website is built around an ever evolving design framework, each one subtly and individually styled to the owner’s taste. All are responsively designed and therefore, easy to use on devices of all size (including smartphones). The layout is ‘bulletproof’, designed to work on all screen sizes and is fully mobile friendly, increasingly the most common device used to view websites. With WordPress powering your website, you have the option to update content yourself and to take advantage of the myriad of other benefits WordPress brings. 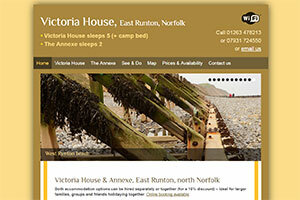 Home page – providing an introduction, summary and overview of what’s on offer. Accommodation – details of the accommodation such as rooms, facilities and provisions. A gallery of photographs featuring the property interior and exterior is displayed. See & Do – information about the location of the property and the owners personal recommendations on places to visit and things to do locally. Map – an interactive Google map allowing the standard map view, satellite view or hybrid (both combined). The property can be pinpointed and the user is able to zoom in and out. Prices & Availability – providing pricing information and in most cases, availability. Clients have the choice to use a free, easy to update availability calendar (as demonstrated at Bure Holiday Cottages). Or for best results we recommend integrating a full availability and online booking system . 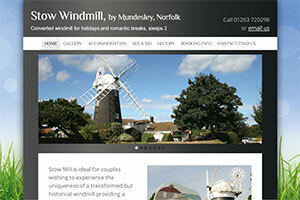 Contact us – a straightforward page geared to generating direct enquiries and bookings. An appropriate feature photograph usually accompanies this page. The page names/titles can be adjusted if required. You may notice minor page name differences when comparing our sample websites below. All of this is available for an all-inclusive one-off design fee of £750 (one property). Multiple properties can be catered for. We offer SSL Security for all our websites, as standard, at no extra cost. Alternatively, owners (particularly those with several properties) are welcome to commission a fully bespoke design in line with our usual commercial packages. These are subject to our usual procedures and design fees as explained at our Frequently Asked Questions page. We can integrate complete availability and online booking systems – and offer advice as to which service will best suit your needs best. Statistics clearly demonstrate that owners offering online booking enjoy significantly higher occupancy levels. The comprehensive management facilities provided can reduce administration considerably (saving you time). 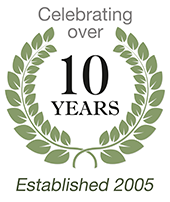 Read more about our bespoke designs. 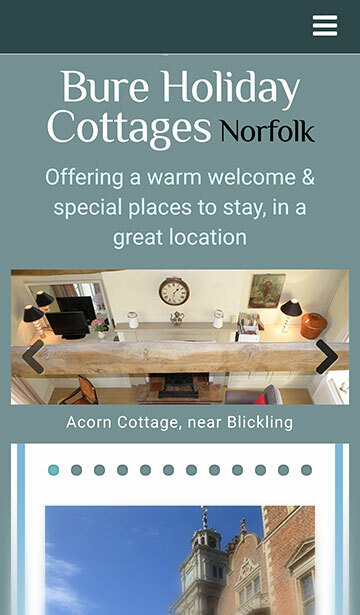 Josh.biz operates a highly successful holiday cottage directory for Norfolk which consistently drives more visitors to customer websites. 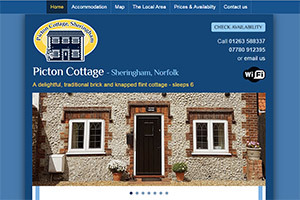 Cottages can also be listed on our sister website, Experience Norfolk – Holiday Cottages.